My inspiration for these came from of course, Mexican Hot Chocolate. I saw some somewhere online and decided to translate the cinnamon-laced chocolate drink to my my favorite little hand-held-excuse-to-have-cake-for-breakfast, muffins. It wasn't very difficult--a basic chocolate muffin, and add some cinnamon and chocolate chips for good measure. And then a nice chocolatey, cinnamony streusel over the top. I found the streusel here, and just added a good dose of cinnamon to it. It's so good! Could've sat there and eaten the streusel with a spoon. A little crunchy that way, but so tasty. These are my entry to Grace's Cinnamon Celebration. I love Grace! She makes the most delectable sweet things that constantly make me say "I want that!" And she's got a thing for cinnamon. Lots of cinnamon. The winner of the Cinnamon Celebration is getting some Vietnamese Cinnamon bark. That's a good reason to enter right there! Head on over and give her your best cinnamon recipe! Heat oven to 350. Grease a 12 cup muffin pan. Sift the dry stuff together, and make a well in the center. Add the butter, oil, milk, eggs and vanilla and chocolate chips. Mix well, but don't overdo it. Fill the muffin cups evenly. Mix the streusel stuff until it's crumbly and top each muffin with some. Bake for 17 minutes or so, and check for doneness. Cool in pan for a few minutes then remove to a rack. A cooling rack, not the old torturing device. And really, I hope you don't have one of those lying around. Because then you're probably too mean to make nice little streusely muffins. To print this recipe, click here! This award comes from Giz and Psychgrad at Equal Opportunity Kitchen. They are two of the sweetest ladies in the food blogging world, and I'm happy to have met them through their blog. Thank you, ladies! 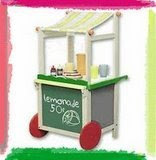 Now, all of you, get on over there and check them out--they have tons of wonderful recipes! 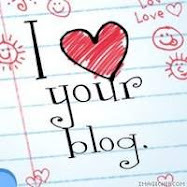 - Put the logo on your blog or post. - Nominate at least 10 blogs which show great Attitude and/or Gratitude! - Be sure to link to your nominees within your post. 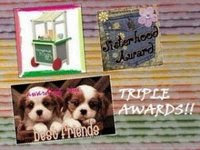 - Let them know that they have received this award by commenting on their blog. - Share the love and link to this post and to the person from whom you received your award. Wow! These look so utterly, uncommonly, absolutely delicious. I love them LOVE them. Adore the ingredients. I so want o make them, like right now. OMG!! Gorgeous photos! Elleburger!! You are crazy!! CRAZY GOOD!!! HAPPY VALENTINE'S DAY!!!! You're like the rockin' muffin momma.. so creative w/ your ideas! 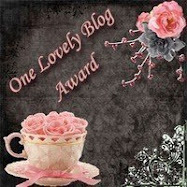 What a great award from 2 great bloggers! Yum muffins too...must bake them SOON!! This muffin looks great! You know, I'm a sucker for a muffin! I'm going to have to try this one! Great combination! Would make an excellent mid-afternoon snack... will bookmark this recipe for next time! Oh the streusel on top get me! Looking great Elle! I love these!!! Mmmmm...cinnamon gets my attention wherever it turns up, but in a cute little muffin with chocolate. Oooo-eeee. Those little morsels are dangerous! 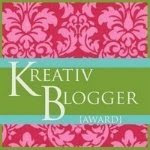 And THANKS for the bloggy award! If I could get my head out of blog admin land, I could build me a mantle for my award. *sigh* Hugs! These look great - I love cinnamon and chocolate together. 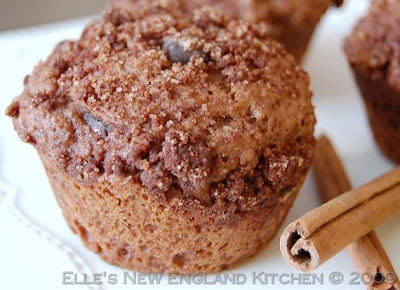 i adore these muffins--chocolate and cinnamon make an unexpectedly terrific combo. Oh I would love to grab one right now, with coffee please. It is so beautiful. The chocolate God is smiling upon you! These look so freaking good! I totally love this!! Great idea!! These muffins need to meet my Mexican Hot Chocolate drinks! The streusel looks soooo gooood! Cinnamon and chocolate makes a heavenly pairing and with some crunch on top I've got all I need for a happy day. I have yet to try Mexican Hot Chocolate but it's sitting right there on my to do list. Ackkkk. Where have I been??? Thanks so much for the award!!! I love those muffins!!! as much time as i spend in Mexico, chocolate is just one of those things I didn't indulge in, much. your choco here looks divine. cinnamon is always a great touch. 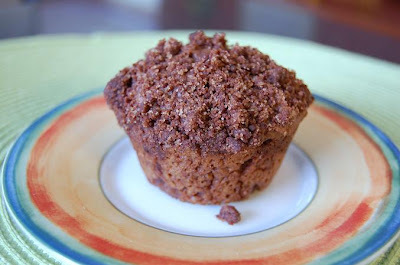 These muffins look so good, chocolate and cinnamon is one of my favorite flavor combinations. 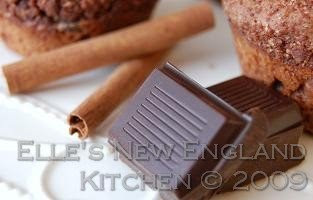 I often add a pinch of cinnamon to my chocolate recipes. These sound soooo good! I just saw them on Grace's post and had to applaud you for creating such a yummy muffin :). My daughter was home visiting and made these muffins. They are delicious. Today while I was in church I kept thinking "I want to get home so that I can have that last muffin". Those muffin tops are looking good! Is it wrong that I just want the tops? these definitely sound like a winner!! These look great, I love the spices. I made mexican hot chocolate brownies not too long ago actually with a tablets of Ibarra chocolate! Your muffins look wonderful! Those look incredible! The cinnamon lowers blood pressure so these are actually health food? Right?! Congrats on the award! Such a yummy looking muffin and it only dirties one bowl? So tempting! Those look yummy. congrats on the award too!!!! These muffins sound great! I like the spices in the mexican chocolate.